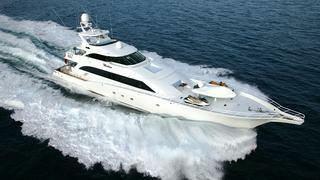 The 43.9 metre sportfish motor yacht Marlena, listed for sale by Yachtzoo, has been sold in an in-house deal. At the time of her delivery in 1998 by Trinity Yachts she was the largest sportfish yacht in the world. She was purchased by a new owner in 2013 and sent to Spain where she received a comprehensive refit and lengthened by 6 metres to her current length of 43.9 metres. ABS classed and MCA compliant, this all-aluminium superyacht accommodates up to 11 guests in a master suite, VIP, two doubles and one twin with a Pullman berth, all with LCD television screens and full en suite bathroom facilities. As might be expected in a yacht of this size, she has all the modern amenities including a large main saloon with comfortable seating, a bar and an entertainment centre including a 61 inch plasma television screen and a Crestron media controller plus a formal dining area forward. More relaxation is available in the sky lounge, offering an entertainment system with a 42 inch plasma television screen. Marlena is fitted with twin Paxman 3,500hp diesel engines and here an important caveat must be added. The starboard engine had failed and cannot be repaired so it would need replacement or the yacht should be repowered entirely. She received significant upgrades in 2012, including complete exterior refinishing, new teak, new gyro speed stabilisers, and she had numerous mechanical systems renewed. Lying in Fort Lauderdale, Florida, Marlena was asking $4.9 million.